The state of Colorado is considering reducing emissions of smog forming compounds from oil and gas developments across the entire state. Two rules are actually being considered. The first would reduce emissions of smog forming compounds from existing oil and gas developments in the Denver metro area. The second would reduce emissions of smog forming compounds from new oil and gas development in the rest of the state. While the smog reductions in the Denver area are needed to reduce unhealthy levels of smog, the statewide reductions would help to prevent smog from becoming a serious problem in the first place. It just makes sense that the state should act now to control air pollution, instead of waiting for it to become a significant health threat. You can express your support for these rules by sending a quick letter to the Air Quality Control Commission. A draft letter is pasted below for you to use (just cut, paste, print, sign, and mail), but please considering sending in a personalized note. Citizen input will be vital to securing these smog reductions and your voice can make a difference. If you have any questions contact Rocky Mountain Clean Air Action at (303) 454-3370 at rmcleanair@gmail.com. I support the proposed revisions to Air Quality Control Commission Regulation 7, which would help reduce smog pollution in Denver and prevent smog pollution from becoming a serious problem in the rest of Colorado. In light of booming oil and gas development, we need to have in place safeguards that ensure long-term protection of the air that we and our communities breathe. We need to be proactive, not reactive in this case. The benefits of clean air are worth the investment from the oil and gas industry. The price of clean air and healthy communities is miniscule when compared to the potential costs of dirty skies and asthma to Coloradoans. We owe it to our children to leave a legacy of clean air in Colorado and I urge the Air Quality Control Commission to adopt the proposed revisions to Regulation 7. Thank you. Scientific evidence shows that stronger standards limiting particulate pollution are needed to prevent the premature deaths of thousands of people every year in the United States, a fact that even the U.S. Environmental Protection Agency (EPA) has agreed upon. Particulates come from smokestacks, tailpipes, and dust from roads and fields, and are classified as "coarse" (10-2.5 microns in diameter) or "fine" (less than 2.5 microns in diameter). The "fine" particles are 1/28 the diameter of a human hair. These particles are so small that if breathed in, fall to the very bottoms of our lungs and may even be absorbed by our bloodstream. Unfortunately, beset by industry pressure, the EPA has indicated it will adopt particulate standards weaker than those recommended by scientists. Under the Clean Air Act, the EPA is required to set nationwide standards for soot particulate pollution that are science-based and ensure full protection of human health. The agency, however, has indicated that it may acquiesce to industry pressure to ignore human health and base its particulate standards on politics, rather than science. Commentary today from Clean Air Watch pretty much sums up the concerns. Particulate pollution is a threat to clean air in the Rocky Mountain Region. In the last six years, communities in the Salt Lake City, Utah area have exceeded the current fine particle standard, which is set at 15 micrograms/meters cubed annually. Monitors in Salt Lake also show that the city is dangerously close to exceeding these standards, with annual levels consistently at 14. 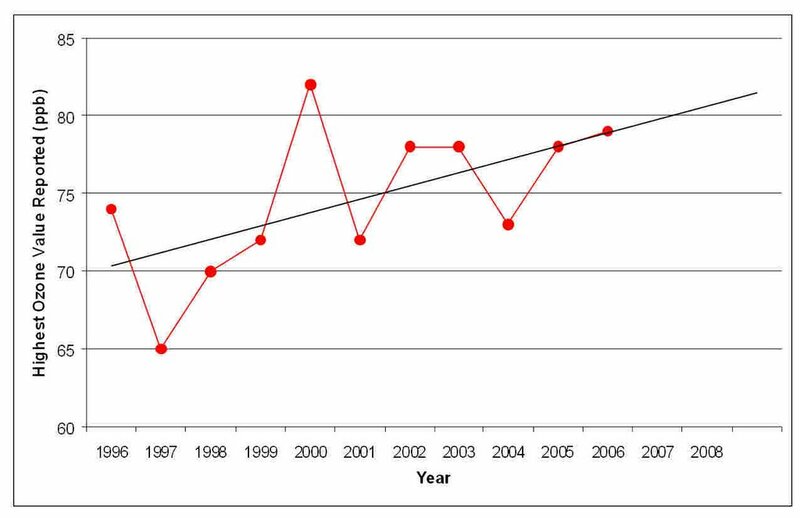 In the Denver metro area, fine particle trends have also come dangerously close to exceeding health standards. At one monitor located at National Jewish Hospital, annual levels climbed from 7.2 to 13.5 in just three years (see chart below, data from EPA). Additionally, several communities in Colorado continue to experience unhealthy levels of coarse particulate pollution. The town of Alamosa is on track to violate the coarse particle standard of 150 micrograms/meter cubed over a 24-hour period by the end this year. With scientists recommending stronger particulate standards, particulate pollution is becoming a much greater threat in the Rocky Mountains. Hopefully, the EPA will stick to the science as it adopts new particulate pollution standards. Rocky Mountain Clean Air Action has filed suit against the U.S. Environmental Protection Agency over its failure to overturn a state-issued air pollution permit for the Denver Regional Landfill, a significant source of smog forming compounds north of Denver. According to the state of Colorado, the landfill, which is located in southern Weld County near the town of Erie, releases over 42,000 pounds of smog forming compounds a year. The landfill also releases over 20,000 pounds of hazardous air pollutants a year. Unfortunately, flaws in the permit would allow much more pollution to be released. While the landfill uses a flare to control landfill gases, the permit fails to impose operation and maintenance requirements to ensure it works at all times. Given that proper operation and maintenance of the flare is needed to control landfill gases, the permit falls short of actually controlling pollution and protecting human health. The permit was issued to the landfill under Title V of the Clean Air Act, which governs the issuance of “operating permits.” Operating permits are required to set forth measures that ensure pollution limits are met and human health is protected. They also impose strict monitoring requirements. Permits under Title V are issued by states, but citizens can petition the EPA to veto them. In March of 2006, Rocky Mountain Clean Air Action petitioned the EPA to overturn the pollution permit for the Denver Regional Landfill. By law, the EPA was required to respond to the petition within 60 days, yet more than five months later, the EPA has yet to respond. The lawsuit will make the EPA respond to the petition and secure a strong permit. Rocky Mountain Clean Air Action and its outstanding volunteers were in Denver's Washington Park yesterday, drumming up support for smog reductions in the Denver metro area. The tabling is the beginning of a widespread effort to generate support for clean air in the Denver metro area from local citizens. The state is considering ratcheting down on emissions of smog forming compounds from oil and gas developments and citizen support will be vital to the success of this proposal. Look for us at other parks and events through November! In an article today, the Associated Press captured yesterday's Air Quality Control Commission meeting and the decision to move forward with rulemaking to reduce smog statewide. Ken Wonstolen with the Colorado Oil and Gas Association commented that "The statewide regulation is not being driven by any imperative." On the contrary, Ken, there is an imperative. This is about getting ahead of pollution problems and proactively reducing emissions of smog forming compounds from oil and gas developments. With drilling ramping up to break more records, we need to act now, rather than later. As Rocky Mountain Clean Air Action commented, our health is on the line here. We can't afford to delay action to protect the health of our children and communities. Clean air in Colorado is gaining momentum. The Air Quality Control Commission today decided to move forward with rulemaking to reduce ozone pollution across the state of Colorado. The proposed rule would require the oil and gas industry to use pollution controls to reduce emissions of ozone-forming compounds by over 90% from oil and gas developments. The proposal would help to protect community health across the state from unhealthy ozone pollution. Even at levels below federal health standards, ozone is a threat to the health of children. The decision to move forward to protect clean air, however, was almost derailed by industry today. Ken Wonstolen with the Colorado Oil and Gas Association and John Jacus, an oil and gas industry lawyer with Davis, Graham, and Stubbs in Denver argued that the Commission should delay moving forward with statewide ozone reductions. Their request for delay was a thinly veiled attempt to push back, if not derail, the adoption much-needed clean air regulations. Rocky Mountain Clean Air Action was the only group to testify against this request. Fortunately, we prevailed. The Commission ultimately agreed that it was wise to move forward with the rulemaking and rejected industry's request for delay. Kudos to the Air Quality Control Comissioners for moving forward to protect clean air. Community health stands to benefit if smog reductions across the state of Colorado are approved by the Colorado Air Quality Control Commission this fall. Tomorrow, the Colorado Air Pollution Control Division is thankfully slated to propose that the Air Quality Control Commission approve new regulations to reduce pollution from oil and gas developments across the state. If adopted, the proposal would reduce emissions of smog forming compounds by over 90% from condensate tanks, glycol dehydrators, and internal combustion engines, which are contributing to rising smog levels, especially in western Colorado. At levels of ozone exposure near or below current U.S. EPA standards, infants are at increased risk of respiratory symptoms, particularly infants whose mothers have physician-diagnosed asthma. When it comes to protecting our children, we can't wait for air pollution to become a problem before we act. Monitoring in Mesa Verde National Park in southwestern Colorado shows that smog levels are rising. Peak annual ozone concentrations have even exceeded the federally established health limit of 80 parts per billion as emissions from the oil and gas industry have steadily risen. If trends continue, ozone health standards could be violated in Mesa Verde by 2008. At the same time, oil and gas development is booming throughout the state. According to the Colorado Oil and Gas Conservation Commission, record numbers of drilling permits have been issued. As of August 1, a total of 2748 drilling permits have been issued. This is more than the total number of permits issued for the entire years of 2004 and 2003. Studies by the Colorado Department of Public Health and Environment show that oil and gas developments are a significant source of smog forming compounds. 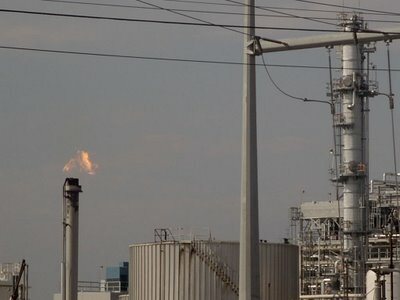 In the Denver metro area, uncontrolled flash emissions from oil and gas developments are the source of 33% of the area’s smog, more than any other source. Despite their contribution to ozone pollution, the oil and gas industry has not yet been required to reduce ozone pollution. The state is making a smart move to proactively protect our clean air in this case, rather than wait until pollution becomes a problem. At a stakeholder meeting today, industry requested that the state delay proposing elimination of the "upset conditions" loophole at this Thursday's Air Quality Control Commission meeting. Industry, headed by Colorado Association of Commerce and Industry air quality committee chair and industry attorney Dennis Arfmann, argued that they needed more time to prepare an alternative proposal to raise before the Commission. Another meeting has been set for September. Just to be clear, industry was given until August 8th to come up with a full alternative proposal. This is yet another example of industry efforts to stall this effort to protect clean air. Fortunately, so long as a final proposal is approved by December of 2006, we'll be fine. This is because any final proposal will need approval by the Colorado legislature before it's approved by the Environmental Protection Agency (EPA). While we'll review industry's proposal, any more delay will not be accepted. It's important to point out that industry's efforts to stall this process seem to have been unending from the start. While this is a very straightforward issue--the EPA has said the loophole is illegal and the loophole is clearly threatening air quality--industry has nevertheless sought to bog down this process with trivial concerns. And for those who may not know, Dennis Arfmann is not only the chair of the air quality committee for the Colorado Association of Commerce and Industry, a pro-industry lobbying group, he's on the Regional Air Quality Council, an entity that's supposed to be working for clean air in the Denver metro area. This industry attorney, pictured below, has represented natural gas companies, coal-fired power plants, oil refineries, cement plants, and other illustrious major polluters. The dangerous and illegal "upset conditions" loophole is on track to be eliminated this fall. This Thursday August 17, the Colorado Air Pollution Control Division is slated to formally request the Air Quality Control Commission eliminate the loophole through a rulemaking. The meeting starts at 9:00 A.M. in the Sabin Room at the Colorado Department of Public Health and Environment. The loophole, which exempts compliance with the Clean Air Act during "Upset Conditions and Breakdowns," allows polluters to endanger public health and welfare and avoid compliance with clean air laws and regulations. On December 22, 2005, Rocky Mountain Clean Air Action filed a petition with the U.S. Environmental Protection Agency (EPA) to require the state of Colorado to finally eliminate the loophole . In response, the EPA threatened to change Colorado regulations itself if the state did not act, stating "[I]f the AQCC [air quality control commission] does not expeditiously adopt changes to the upset rule that are consistent with the Clean Air Act, we intend to propose a SIP [state implementation plan] call using our notice and comment rulemaking authority." Polluters in Colorado have used the loophole extensively to avoid being held accountable to clean air laws and public health and welfare. Data from the state of Colorado shows that since 1999, two facilities--the Holcim cement plant near Florence and Tri-State Generation's Craig coal-fired power plant--have claimed over 300 upsets. Most recently, state data shows that the CEMEX cement plant near Lyons used the loophole to get out of complying with limits on dioxin emissions on May 23, 2005. 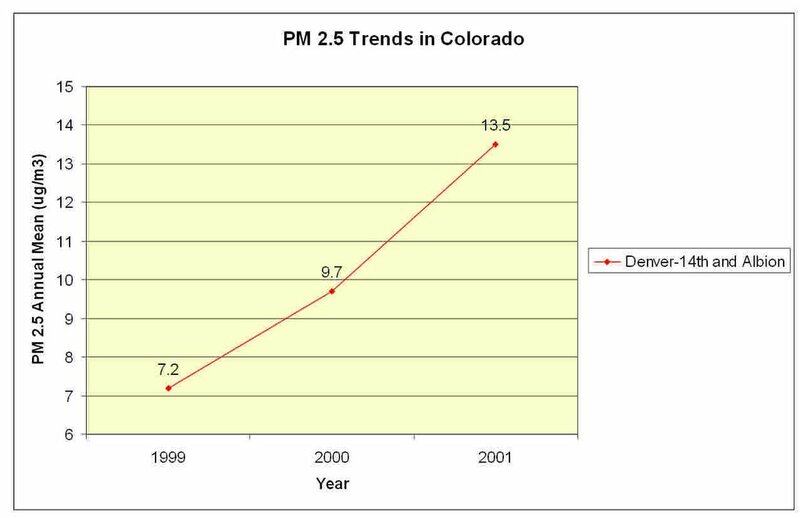 Upsets are also a threat to ambient air quality, especially in the Denver metro area. A review of data on file with the state shows that between 2001-2006, the Suncor oil refinery north of Denver (picture above) and the BP Wattenberg natural gas processing plant east of Denver experienced 66 and 79 upsets, respectively, all related to the emission of ozone forming compounds. 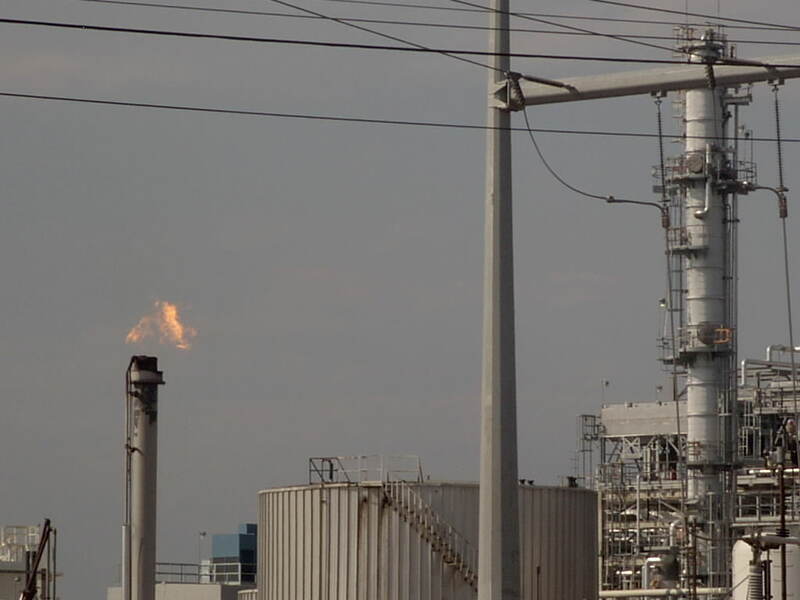 Just in 2005, the BP Wattenberg gas plant experienced an upset that released ozone forming compounds for over 90 days. In light of dangerously high ozone, these upsets pose serious threats to ambient air and human health. Hopefully the Air Quality Control Commission will eliminate this loophole as soon as possible to protect our clean air. An article last week in the Durango Herald reported that the Four Corners Air Quality Task Force is working to address mercury pollution released from power plants and other factories in the region. The Task Force is apparently looking into whether mercury emissions in the air are leading to mercury contamination of local reservoirs and other water bodies. The article, however, points to a fundamental dilemma facing the Task Force: that Colorado has no restrictions on mercury emissions and that federal regulations actually allow more mercury pollution than what already exists. Mercury is a serious threat to the health of our communities, especially to children and pregnant mothers. There are 11 waterbodies in Colorado with fish consumption advisories related to mercury contamination. The most recent advisory was posted June 30 for lakes in the Denver metro area. The state is actually moving forward to adopt the federal regulations that allow for more mercury pollution. More information is on their website. Colorado needs to step up to reduce mercury pollution from power plants and factories, not allow our environment to be poisoned even more. Our children's future depends on it. Rocky Mountain Clean Air Action gave a presentation in Cañon City, Colorado last night to the Colorado Citizens Against Toxic Waste. 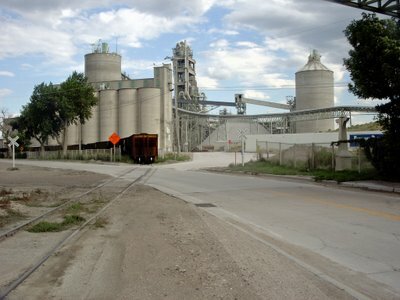 Cañon City is in Fremont County, home to the Holcim cement plant. It's the county's largest air polluter, releasing 31 pounds of mercury, 11 pounds of lead, and 0.17 grams of dioxins a year. The dioxin emissions may seem small, but the EPA has determined that exposure to just 0.000001 grams over 70 years is "safe" for people. The amount of dioxins released by Holcim in a year is enough to poison all the people of Fremont County four-fold. Not only that, but Holcim is the state of Colorado's largest "upset" polluter. What does that mean? It means that Holcim has used the "upset conditions" loophole in Colorado's law to violate air pollution limits that are set to protect human health. Since 1999, Holcim has claimed over 380 upsets. Holcim has also had many upsets that have lasted for days. In 2004, Holcim claimed an "upset" where for 6 days and 21 hours, the company violated its sulfur dioxide pollution limits. Read our previous post for more on the loophole and what we're doing about it. On another note, when we drove by the Holcim plant, there was a lot of cement dust blowing around, a sure sign that they're violating their air permit. Colorado Citizens Against Toxic Waste and Rocky Mountain Clean Air Action are also looking into air quality violations at the Cotter Uranium mill in Cañon City. The mill is a notorious polluter and last May, the state issued Cotter a notice of violation for violating limits on volatile organic compound (VOC) emissions. While Cotter is limited to 85 tons/year of VOC emissions, from January to August of 2005, Cotter released 350.8 tons of VOCs. The state may be pushing to revoke Cotter's entire air permit as a result. However, citizen pressure will be needed to make sure our clean air is not jeopardized in the future. The Environmental Protection Agency's proposed deferral of the Denver area's 8-hour ozone nonattainment designation is online today. The deferral postpones imposing strict clean air requirements for ozone until December 31, 2007. These strict air requirements, however, would do more to protect us from ozone pollution than the current Denver Ozone Early Action Compact. The Compact is a regulatory scheme that has let ozone rise to unhealthy levels dozens of times this year. 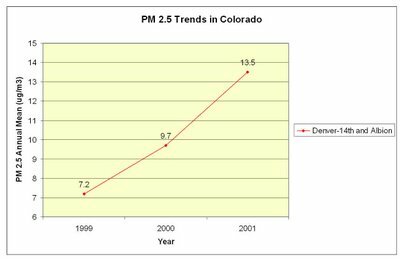 In a news release, the EPA claims the state of Colorado has made "progress" in reducing smog in the Denver metro area. So far this summer, there's been nearly 50 exceedances of health standards for smog, also known as ozone. This is not progress. Protect the health of our children and communities by immeditaely designating the Denver metro area as nonattainment for the 8-hour ozone National Ambient Air Quality Standard. We can't afford to wait until December 31, 2007 to protect clean air. We need protection now. The Associated Press today reported on diesel shortages in Colorado. The article reports that one of the reasons for the shortage is "difficulties complying with a new federal clean-air rule." Let's get real here. Complying with clean air rules is not responsible for any diesel shortage. In 2001, the Environmental Protection Agency gave industry until June 1, 2006 to clean up diesel used in highway vehicles, by reducing sulfur content in diesel to 15 parts per million, down from 500 parts per million. That's right--industry has had five years to comply with sulfur reduction requirements and protect our air. Five years should have been more than enough time to come into compliance, yet industry chose to wait until the 11th hour to plan for clean air. If anything, footdragging, not clean air, is responsible for diesel shortages in Colorado. Regardless, we can all breathe easier now that clean diesel requirements are finally in effect. The photo below, from the Colorado Power Stroke club website, shows how filthy diesel engines can be and underscores the importance of low sulfur requirements. The U.S. Environmental Protection Agency (EPA) is slated to announce that Denver metro air is healthy, despite over 40 readings so far this year of unhealthy levels of smog, or ozone pollution, throughout the metro area. This is a dangerous and misleading proclamation for the EPA to make. Smog is threatening children and communities throughout the Denver metro area, a fact the EPA seems to be covering up. Despite unhealthy levels, the EPA is proposing to defer designating the Denver metro area as nonattainment for ozone. The Clean Air Act, however, prohibits the EPA from doing this when ozone levels rise to unhealthy levels. Check out the full post at the Denver Ozone blog. Sadly, it seems we need a nonattainment designation to gain recognition that there is a serious health problem and to secure the tools to fix this problem. A nonattainment designation would do just that and Rocky Mountain Clean Air Action aims to make that happen. Rocky Mountain Clean Air Action was featured in yesterday's Denver Post article on unhealthy smog levels in the Denver metro area. More needs to be done to reduce smog, or ozone pollution, in Denver. While the state is proposing to impose stronger ozone controls on the oil and gas industry, limiting pollution from smokestacks, reducing traffic, and better transportation planning are also needed. 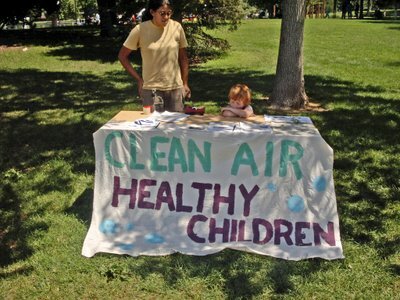 Rocky Mountain Clean Air Action continues to push for these changes to protect our health. Rocky Mountain Clean Air Action is taking aim to protect clean air by eliminating a 30 year old loophole in Colorado's air quality law. The loophole allows polluters to release air pollution above levels meant to protect human health during an "upset." Last December, we called on the U.S. Environmental Protection Agency to make the state of Colorado remove this loophole. In response, the state is acting and plans to have the loophole eliminated by the end of the year. What is an upset? An "upset" is vaguely defined as an unpredictable event, something that is not reasonably preventable, or something that is beyond the control of polluters. The questions then come up, what is unpredictable? What is reasonably preventable? What is within the control of polluters? It's this vagueness that has allowed polluters to use the "upset" loophole regularly and with dangerous consequences. Take a look at the state's list of reported upsets over the years. Colorado's two cement plants, for example, have claimed hundreds of upsets in the last five years. These upsets have released highly toxic dioxins, particulate matter, sulfur dioxide, and other pollutants above and beyond levels meant to protect human health. Our presentation has more unbelievable examples of how upsets threaten our air. 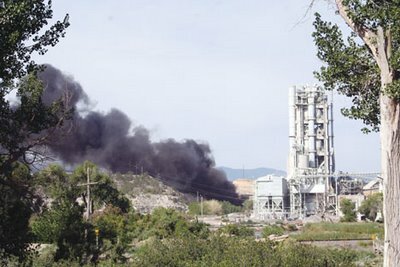 Just last Friday, Holcim's cement plant near Florence experienced an upset--a tire fire that spewed black smoke through local communities. See the upset below (taken by Debbie Bell with the Daily Record). But the bottomline is that there should be no upsets. Good maintenance, thorough planning, equipment upgrades, and careful attention can prevent most any "upset." This is our clean air at stake and we can't afford to allow an upset to ruin that.